I’ve been injured over the past few months. After a trip to the orthopedist, I was diagnosed with Trochanteric Bursitis and told to stop running until it was taken care of. That’s at least three weeks with a potential to be three months. Might as well be forever. If you’re a runner, you know what I mean. Being still this long is making me go a little loopy. Luckily, though, I’m not in a rut, and I’m using this as an opportunity to experiment and try new things. And outside of the sadness and mild anxiety that I feel about being unable to run, I’m having a hell of a time finding other activities that I love. If you’re looking to find ways to spice up your workouts or to find an alternative because of an injury, I’ve got three that have worked wonders for me. 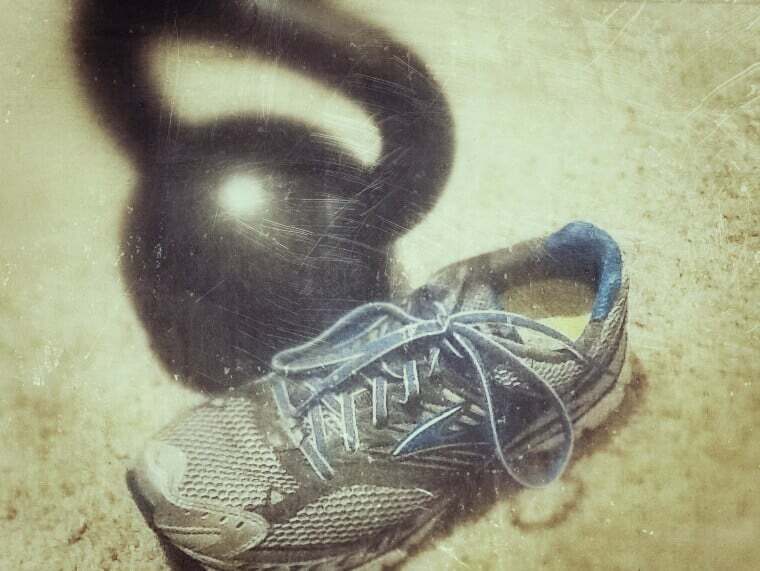 I love my kettlebells. Seriously. Like a lot. Even though my doctor said I can’t run or use my hip very much–which rules out swings and squats–I can still do a lot with my kettlebells. Even without the whole-body exercises I love, I get a great workout and feel accomplished when I do this in the morning before work. I hope I can get use of my hip back and take it up a few notches over the winter. But even if I can’t, I’m seeing growth and progress in what I’m doing, which makes me happy. 2. What’s Got Two Wheels and One Awesome Rider? I love my bike. Ever since I got it last year, I’ve loved my colorful, fixed-gear, hipster bike. And now that I’m immobilized due to injury, I love it even more. My doctor told me I could do light biking, so I snagged an indoor bike trainer and moved this baby in the house so I can finally get over the no-cardio-crazies. I love yoga. A ton. Like a lot. When I did P90X a couple years ago, my favorite part was the yoga. Since then, I’ve tried to keep up with doing some yoga every couple of weeks. But because of living in a really small town, there aren’t easily accessible yoga classes. After doing a bit of GoogleFu, I found DailyBurn, which offers a 30-day free trial. I started up with it, and fully intend to follow the program through for the month. I’ve loved the sessions I’ve done so far. I feel more relaxed and fit since starting to do yoga more often, and that’s saying a lot since the past couple of weeks have been hotbeds of stress and anxiety for a lot of reasons I won’t go into here. Suffice it to say say that I’m becoming a believer in the meditative and spiritual nature of yoga at this point. So if you’re injured or in a rut, try some new stuff you haven’t been able to do in a while–or that you’ve always wanted to try. You might hate it, and that’s okay. But you might be like me and fall in love with something that takes your fitness to a whole new level. What activities and fitness goodies have you tried as an experiment that ended up as staples in your routines? Aww B.J., really sorry to hear this. As per the usual, though, I see you’ve taken the negative and found the inevitable positive–GO YOU. I truly understand the “may as well be forever”. I was out for a week due to a pulled muscle and then tons of rain. I thought I would lose it, and finally gave into pouring rain for the escape. On another note, thanks for the ongoing inspiration. My last post (novel?) to you mentioned the struggle I was having with consistently improving my run:cd ratio. My last few runs have seen me with no cd until hitting over 1.5 miles. So thanks to you…once again. Hang in there, pal.